Bread : One of the staples in the household, easy for a delicious breakfast, lunch, dinner and dessert. So versatile it can practical be made into anything. 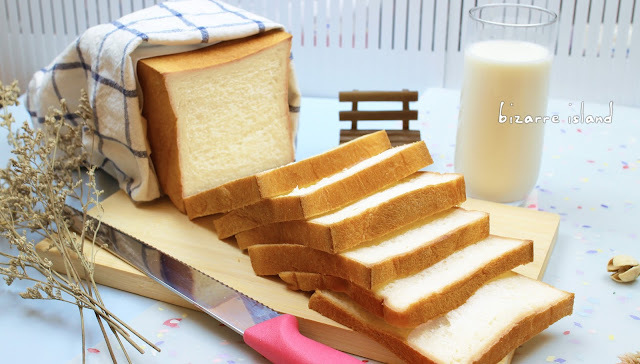 So today, we show you our recipe for a white loaf bread. Master this basic and turn it into all the different fantastic things. Be sure to stick around, we are going to do tons of bread related recipes. We will cover "all times of the day" meals, all just from this classic bread. We used a pullman loaf pan for a reason, but if you don't have one, just use your normal pan. 19. Cover it and let it rise the second time in a warm place for 45 min until the dough reaches the pan line. how much is loaf pan size you used in this recipe ? Can l use all purpose flour instead of bread flour? Is there any alternative for malt powder? It's awesome. One question can we remove egg from the recipe ? The egg helps the bread rise and make the bread more tender. If, for reasons, that you cannot consume eggs, omitting it will be ok but it just won't come out quite the same. I would like to try this recipe using a pullman pan I received as a present. It is a very large pan; Matfer Bourgeat 341643 Exopan Long Bread Mold with Lid. It measures 15.8 x 5.5 x 5.5 inches. Do you happen to know how to convert the recipe and temperature for this size pan? It is a little larger than the full loaves the bakeries in Japan use to make their Shokkupan etc. Your help will be greatly appreciated. Once I perfect the recipe, I will be happy to share the photos of the finished product and crumb. I would estimate around 4 portions of the recipe will fill the pan but you may have to test it to know for sure. For such a large pan you should divide the dough into 6 portions and bake it 170C for 60min and do a test for doneness, if it is not done, test it every 15 min. To test the doneness, remove the lid and see if it is golden brown, tap on the surface and if it sounds hollow, it is done. Is it the same if i use instant dry yeast? Thank you so much for your suggestions for the large French Matfer Bourgeat pan that I have. I tried it and it turned out almost perfect. I should have gone the full 60 or even 65 minutes you suggested but I was worried and stopped at 55 minutes. It was just under, very slightly. I multiplied the recipe but have a question: When I was sliding the lid off, the bread started to puff up as if it was packed too tightly. When you make this bread does it seem as though the bread is trying to escape when sliding the lid off? If not, I may try 3.5 vs 4 portions. The link to the pan above: Is this the exact pan you use? I would like to find a pan that is around 4.5 inches wide and tall for when I want to make just a normal portion. You mentioned yours is a 1.5lb (450gram) pan but there were no measurements of the actual finished bread or pan. I really miss the Japanese Shokupan breads when I lived overseas. The 5.5 inch pullman I bought is too big but regular pullmans are too small. Thanks so much for your help. 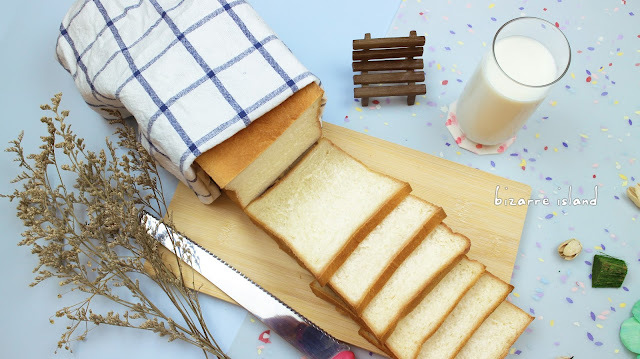 I thought I would never find a great recipe that tastes like the bread in Japan! It shouldn't be "escaping" the pan, you should try a smaller portion. The link is not the exact pan we use but the dimensions are of the similar and would work out great too. Glad that I could help :) Update us anytime ~ See you around ! The bread and water wouldn't turn into a pudding like substance, it just turned into dough. What did I do wrong?